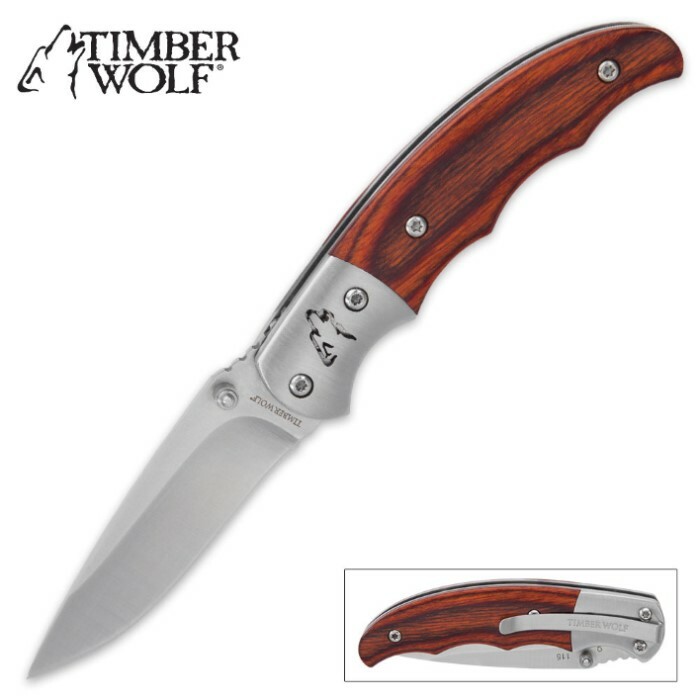 Timber Wolf Brown Pakkawood Pocket Knife | BUDK.com - Knives & Swords At The Lowest Prices! The compact size of the Timber Wolf Brown Pakkawood Pocket Knife makes it unobtrusive in your pocket and just an all-around great EDC. It has a 2 1/2 satin finished stainless steel blade that is up to any cutting task you put in front of it. The attractive brown pakkawood handle features a shiny aluminum bolster with the iconic Timber Wolf howling wolf. A stainless steel pocket clip lets you carry this pocket knife with ease. We got this knife for a first knife for our 11 year old grandson for Christmas. It's the perfect size for him, and he loved it! Thanks for the great deal. Good little knife, sharp out of the box! !